Provide a great place to unwind outdoors, the Capri style seating of Octagon Picnic Table allows guests to sit back in comfort. Made specifically for all-weather applications with all-steel construction and ultra-resilient finishes. Engineered ready for lasting service the tops and seats are sealed in an ultra-modern polyethylene finish and the frame with a state-of-the-art powder-coating. These finishes offer superior protection from abrasion, corrosion and UV damage. 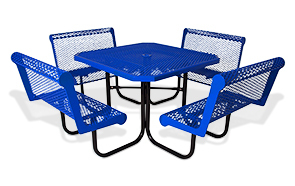 Great for around public pools, cafes, schools, amusement parks and courtyards, this table is a top choice for commercial outdoor patio seating.